An offshoot of Parrot Jungle, Jungle Island is a new complex offering an exciting array of wildlife from parrots and macaws to crocodiles and penguins. 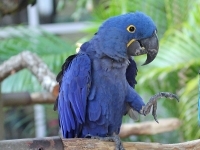 You can witness over 200 parrots at the Manu Encounter, the world's only aviary replicating the clay cliffs of Manu, Peru. At the Parrot Bowl, a gaping amphitheatre, you can be entertained by the clever antics of cockatoos, parrots, and macaws. Look out for the rare albino alligator and 21-foot crocodile at the Serpentarium. The waterpark featuring the 168-foot Hippo Slide, with an exhilarating 40-degree drop is also a favourite. The theme park is full of fun and interesting animals to marvel and interact with.